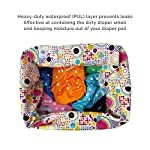 Baby Tooshy Diaper Pail Liner Set (2) – Large Capacity Wet Bag for Cloth & Disposable Diapers. Effectively Contains Stinky Diapers. Heavy Duty PUL offers Superior Leak Free Protection. 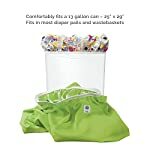 Home / Eat / Trash Bags / Baby Tooshy Diaper Pail Liner Set (2) – Large Capacity Wet Bag for Cloth & Disposable Diapers. Effectively Contains Stinky Diapers. Heavy Duty PUL offers Superior Leak Free Protection. 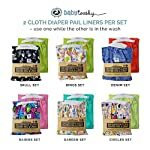 Contains the stink – Baby Tooshy’s Diaper Pail Liners are made of the highest quality waterproof PUL fabric. That, combined with the quality stitching, makes it extremely effective in containing the dirty diaper laundry smell. 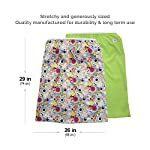 Large Capacity Wet Bag to Reduce the need to change the Diaper Pail – Baby Tooshy’s diaper pail liner measures 28 x 25 inches, making it big enough to comfortably fit a 13 gallon trash can or large capacity diaper pail. That means, you won’t need to emty it out as often. Strong elastic holds onto any diaper pail or trash can you use. 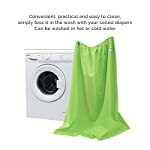 It is also washable and reusable. Superior Protection to Contain Leaks and Smells – Heavy Duty PUL and thorough stitching ensures NO LEAKS through your large wet bag. Safe to wash in hot or cold water, with no lingering dirty diaper smells. 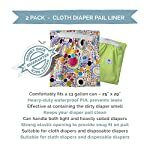 Use confidently with light or even heavily soiled disposable or cloth diapers. The Baby Tooshy Diaper Pail Liner will work in any existing diaper system you use. 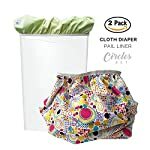 2 Wet Diaper Pail Liners to Reduce Hassle – Having two liners makes life a little easier because you can use one while the other is in the washing machine. 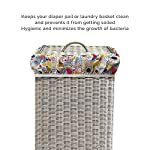 Satisfaction Guarantee – Return if you’re not Completely Satisfied – This Diaper Pail Liner Set is made of the same high quality that Baby Tooshy has come to be known for. Buy with Confidence. All sales come with a 100% Manufacturer’s Money Back Guarantee.